Just as a well-conditioned and coordinated body is essential for the successful athlete, a well-furnished and masterful mind is a necessary attribute for the successful life. Just as we chin ourselves on a bar above our heads to cause growth in our muscles, we must study great works above our heads in order to create growth in the mind. However, we need help when beginning a new fitness program for the body or mind. When we’re out of shape physically, we benefit from a personal trainer who provides preliminary exercises to condition our bodies, as well as a helpful boost during the actual chin-ups until we acquire enough strength to lift ourselves without assistance. Intellectual training is similar. In order to read books above our heads, or listen to music that we fear is beyond us, or view masterpieces of visual art with a keen eye, we need a coach who can prepare the mind for understanding great works while also lifting us up to a higher plane during our studies. This is precisely what Bill Cathers provides to his clients through speaking, leadership training, coaching, and professional development. From the philosophy of Aristotle to the music of Beethoven and beyond, Mr. Cathers can help you understand the Great Books and Great Ideas that provide the foundation needed for a prosperous professional career and a successful pursuit of happiness. Whether you are an individual, educational institution, corporation, athletic team, non-profit organization, or government body, Mr. Cathers’ coaching in the essential intellectual and moral habits is an invaluable asset to include in your self-development portfolio and your organization’s strategic plan. Mr. Cathers is a dynamic speaker who can inspire and instruct on a variety of topics. He speaks to diverse groups and can help motivate your organization to fulfill its mission and achieve greatness. Mr. Cathers utilizes insights and wisdom from the Great Books, music, art, athletics, and beyond to bring a depth and wisdom to his presentations that make his speeches profound, as well as passionate. Prior to working as an educator in Los Angeles and as a moderator at The Aspen Institute, Mr. Cathers spent each summer during college working for legendary UCLA coach John Wooden at his youth basketball camps; and upon graduating from college, played professional basketball in Europe. Mr. Cathers’ unique background enables him to design speeches and presentations that meet your needs. See further testimony about the power of Mr. Cathers’ speeches, along with video clips in the Gallery. In addition to his work with preeminent leaders at The Aspen Institute, Mr. Cathers has designed and lead numerous leadership seminars and professional development workshops for a variety of organizations. Whether you are an educational institution, corporation, non-profit, government body, or athletic team, Mr. Cathers can help you achieve success with his speeches, leadership seminars, and professional development workshops. Cathers’ presentations provide learning and training that cultivates confidence combined with wisdom, passion with prudence, and vision with practical skills. The art of communication is an aspect of intellectual fitness that calls for special attention because the words we speak, the ideas we convey, and the emotions we elicit can motivate or alienate others in a powerful manner. 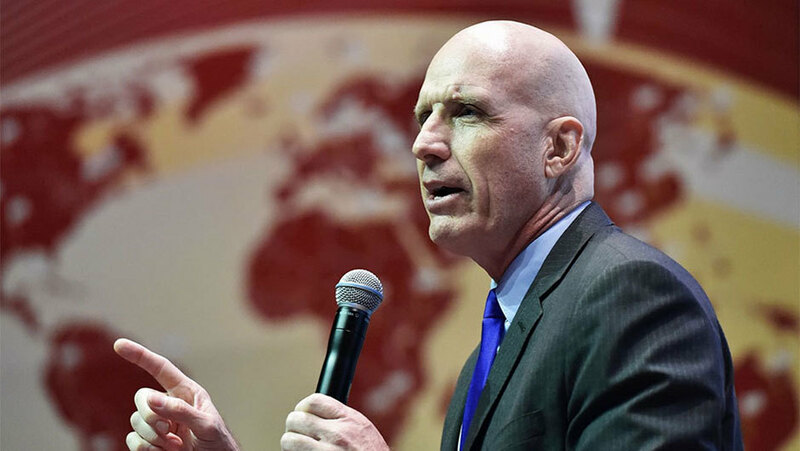 William Cathers, an accomplished public speaker himself, has transformed high school students into award-winning orators and coached a variety of elite leaders in the art of persuasion. Cathers can coach you to a level of virtuosity that will empower you to understand and explain complex ideas, handle nuance and controversy, persuade and motivate, and enthrall listeners with your insight and passion. Whether the task is prepared or impromptu speaking, Cathers’ coaching will instill you with the calm confidence that comes from being prepared. A renowned moderator of Socratic seminars, Cathers can also teach you the efficacy of finely tuned listening skills combined with the unique techniques of engaging others in productive dialogue. Leadership in a free society depends upon the art of persuasion. Contact William Cathers today to find out more about utilizing his coaching expertise in the essential skills of speaking, listening, and persuading. Mr. Cathers is also available as a speechwriter for specific occasions. Whether in Mr. Cathers’ office in Los Angeles, or in the privacy of your own home or workplace, Bill will guide you through an intellectual cross-training course of Great Books, music, and visual art that will provide you with the essential foundation for long-term personal and professional growth. He will teach you how to read and discuss important books with precision and insight, listen to great music with understanding and enjoyment, and view masterpieces of art with acumen and delight. Mr. Cathers will also help you create your own private library of books, music, and video that you have learned under his tutelage and can utilize in your daily life. Now is the time to study the great works that you have longed to know and understand! Contact William Cathers today and begin making a self that is more intensely alive!